Order in ranking, number 20. 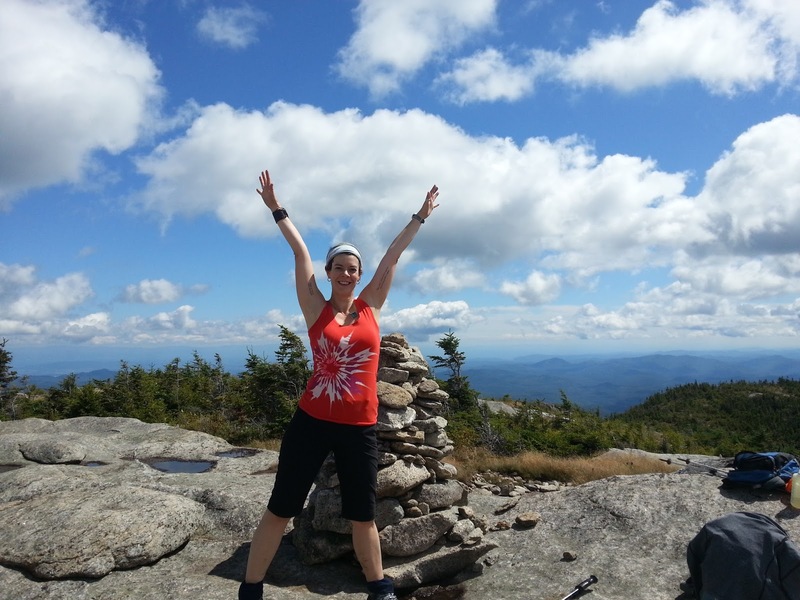 This past weekend, I headed down to the Adirondacks yet again, but this time with a gaggle of girls. 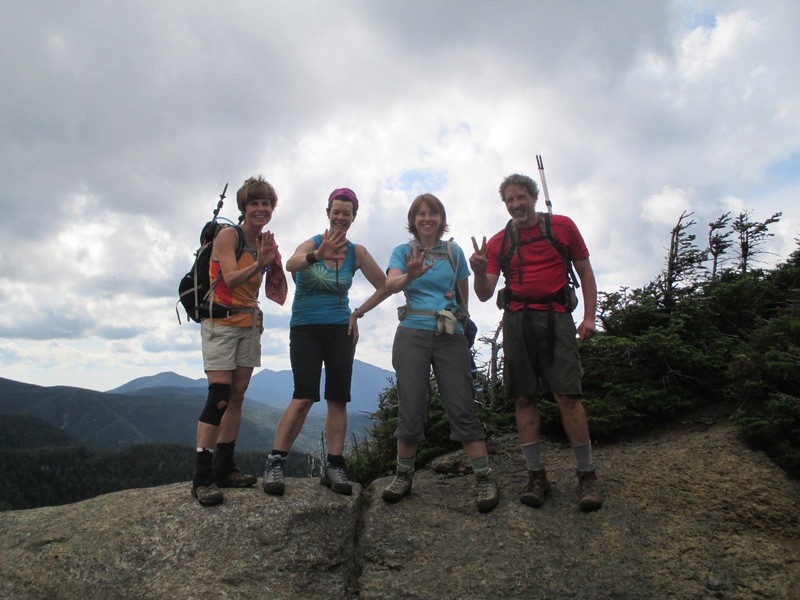 Besides my climbing partner Stephanie, there were four other women who were keen on hiking and camping in the Adirondacks: Terri, Mel, Nath, and Christine. We drove down in a thunderstorm, but thankfully the rain let up long enough for us to erect our tents….and tarps over the tents. It proceeded to rain most of the night, but Friday morning dawn with a cloudy sky, but no sign of rain. 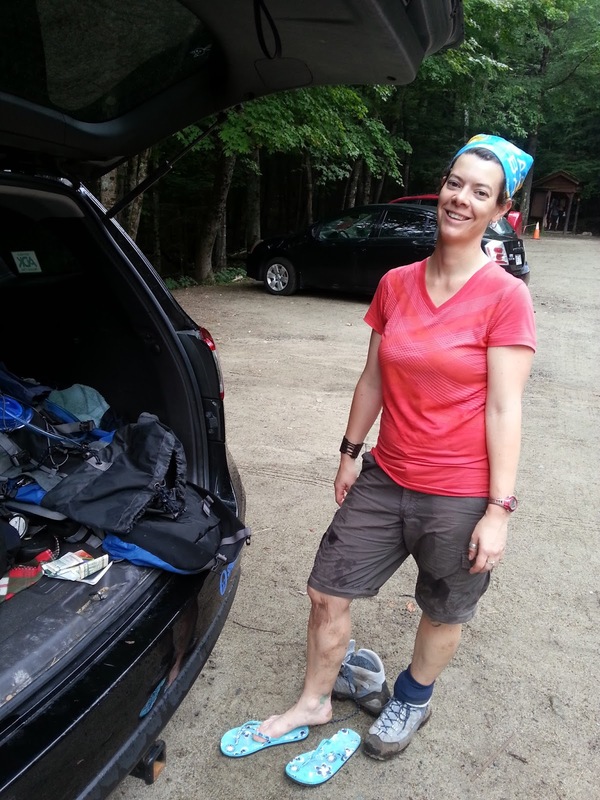 We set off for the trailheads – our plan being to park one car at the trailhead to Rock Peak Ridge on Route 9, pile into the other car and park at the Roaring Brook trailhead to Giant Mountain and Rocky Peak Ridge on Route 73. We got off to a slightly later start that we had hoped, but it was still early enough to get parking. While Stephanie and I have climbed Giant before, the women were new to climbing the 46ers, with the exception of Christine, who accompanied Stephanie on her hike up Big Slide. Giant is certainly an interesting choice for a first climb – most people would start with Cascade or Porter, as the two easiest. But Giant is a nice climb, if a little steep in places. It also involves some minor rock scrambling that isn’t very scary. We took a few breaks on the way up – Stephanie wasn’t feeling too well, and the other women wanted time to soak in the experience. We weren’t trying to set any records, so we meandered along, taking breaks, chatting, and going at our own pace. It’s funny how trails seem to change – there was lots of stuff that neither Stephanie nor I remembered, but other places that we recalled in great detail – such as the first rocky slab that you have to scramble up. The first time we climbed it, we stuck to the edges, rather afraid of falling down the rock, and anchoring each other as we took pictures. This time, however, we were much more confident (thank you, cliffs of Saddleback) and strode out to take photos from the same lookout. After a bit, Stephanie made the call to send the other women on ahead of us as she was feeling a little out of sorts and wanted to take a bit longer of a breather. The reasoning was that they wanted to summit both Giant and Rocky Peak Ridge, and if they went ahead they could summit Giant, and we would meet up with them at the junction for Rocky Peak Ridge. Neither party would miss out on what they wanted, and no one would have to wait for the other. So the four women went on, and I stayed back with Stephanie. We slowly made our way up, chatting with each other about our hike that day and the next, and about what hikes we might like to do next year. We moved at our pace – we’re slow, but we’re steady. We rarely need to take long breaks, because we don’t push ourselves too hard above what we’re comfortable with. So I set on a little bit quicker, and reached the junction to Rocky Peak Ridge, to learn from other hikers that the other women had just left to summit Giant. I sat down, and prepared to wait (and enjoy the sun that had burnt off the clouds). After a quick wait, both Stephanie and other women joined me. We decided that Christine would stay with Stephanie, as she had only intended to hike Giant, and Nath, Mel, Terri and I would hike over to Rocky Peak Ridge. After that, Nath would return to meet up with Christine and Stephanie, and Mel, Terri and I would continue the traverse to the Route 9 trailhead. The “steep descent” on the col between Giant and Rocky Peak Ridge wasn’t that bad. I felt it was on part with the rocky steep bits on Lower Wolf Jaw – perhaps a bit less. 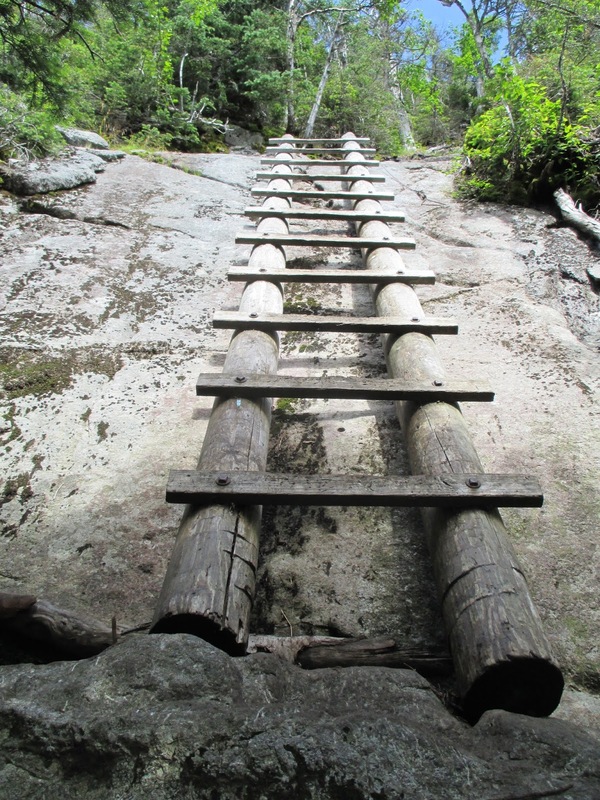 The ascent on the way to Rocky Peak Ridge was steep, but no more so than most Adirondack hikes – there at least was no rock scrambling involved. 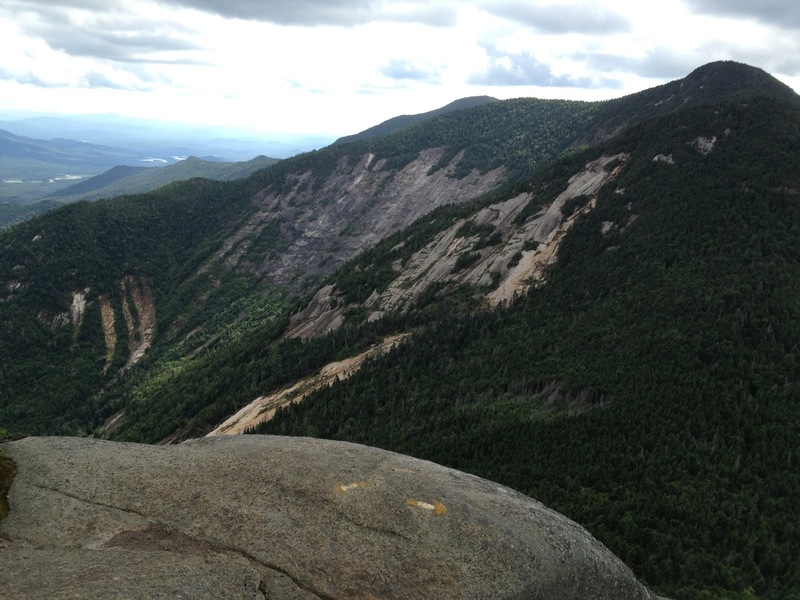 All in all, it’s very doable if you’ve done several hikes in the Adirondacks that involve some rocky scrambling. We quickly hit Rocky Peak Ridge, and took various group and solo photos. From there, Nath headed back, and Mel, Terri and I headed on. 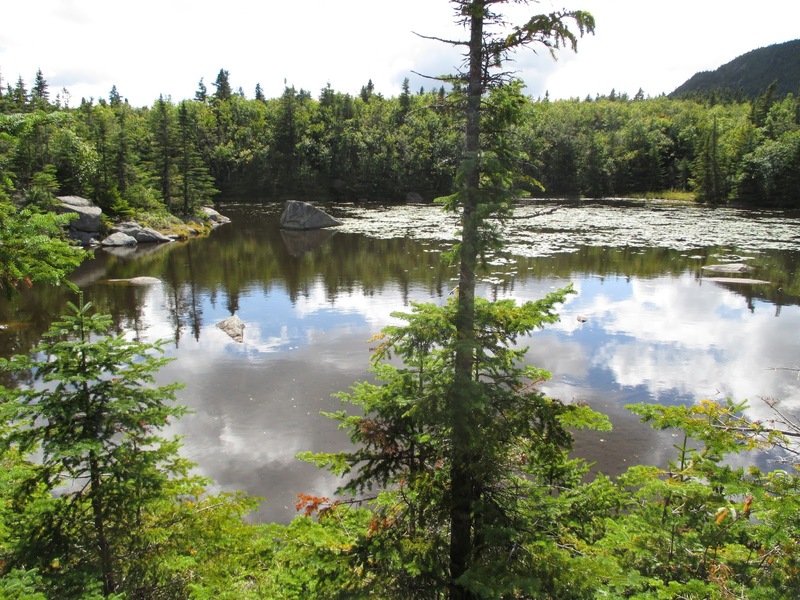 The trail to Route 9 is lovely, descending to pass by a pond (Mary Louise Pond) before ascending to Rocky Mountain (not to be confused with Rocky Peak Ridge). Lots of open rock face, and lots of great views from here. Then it was another descent, before climbing again to Bald Mountain. Again, lots of open rock and some fantastic views. The trail is clearly marked over these peaks with not only with yellow paint blazes, but also with cairns that lead you around the rocky summits to the path on the other side. The map we had, had one more name on “Blueberry Cobbles” so we figured we were fairly close to the end of the hike. We set on, and descended and ascended yet again. Here we were faced with not only open rock face, but very slanted open rock face. I was reminded of the cliffs of Saddleback – although these were not as steep, nor as perilous looking as Saddleback, they were intimidating. We took it slow over the rocks, as we slowly starting to descend yet again. From here, we thought it would be a straightforward hike to the trailhead. And then….a sign. There seemed to be no reason for this sign (although, it could be that it was marking the junction to a short cut, that we found out about after the fact) that said “Blueberry Cobbles Rte 9 2.4 miles”. Had we gone 2.4 miles since Blueberry Cobbles? Did we have 2.4 miles to go? We had no idea. And then, suddenly….another ascent. That’s right – our fifth ascent since leaving Rocky Peak Ridge. We were going up again. When, we wondered, would this hike be over? We continued to follow the trail, and started another descent when we saw a sign for a red-marked trail that was a short-cut around Blueberry Cobbles summit. I’m not sure how much time could have been cut off if we had followed this trail, but it may have given us one less ascent/descent. We picked up the pace, as much as we could given the fact that it was nearing on 8 hours of hiking at this point. We were moving on auto-pilot, when we saw something in the distance. We didn’t want to be fooled – far too many times we had seen a small clearing in front of us, and we had thought it was the parking lot to no avail. But this time was different. This time we could see sun glinting off of metal. And it was – we had finally, at 6:20, hit the parking lot. The traverse is a nice hike, but it’s long, and the constant up and down as you climb and descend the various peaks between makes it feel even longer. But the views are quite nice and almost make up for it. 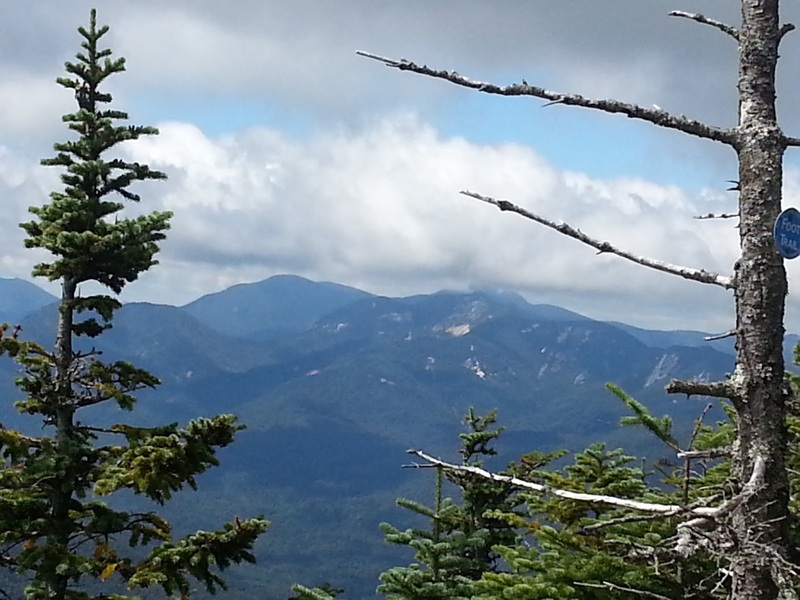 Still, I’d recommend climbing Rocky Peak Ridge from Giant. Order in ranking, number 29. 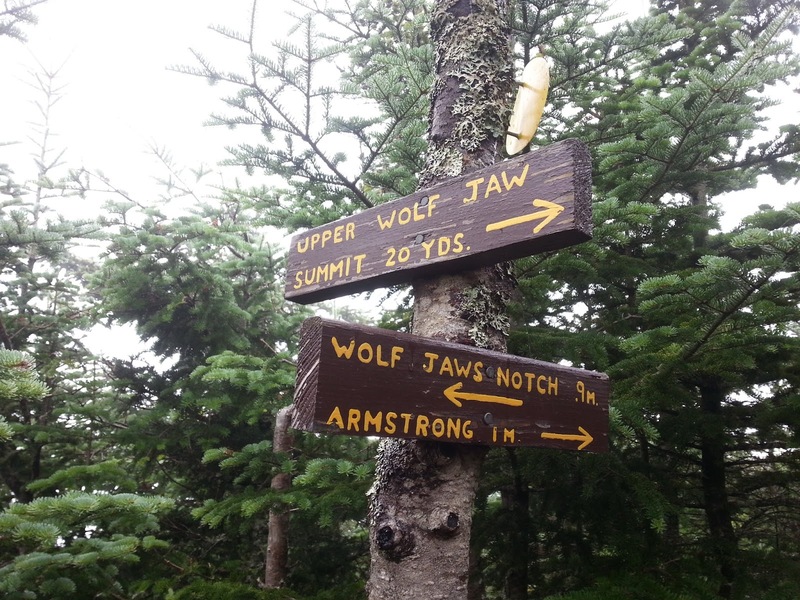 I decided not to blog right away about Upper Wolf Jaw. Things have been busy with life in general, and other up-coming trips. But here it is, finally. So some back story if you haven’t read my post on our HaBaSa adventure: We were, in the end, supposed to hike HaBaSa on the Saturday, and then on the Sunday do Gothics-Armstrong-Upper Wolf Jaw as a loop, in that order. Only on Saturday night, the forecast was for rain and possible thunder storms, so we decided we’d switch the order, so that at least that way, we’d get Upper Wolf Jaw done, if nothing else. Why did it matter that we got Upper Wolf Jaw done? Well, you see – we’ve been buying patches for the hikes. After we complete a hike, we buy the patch. 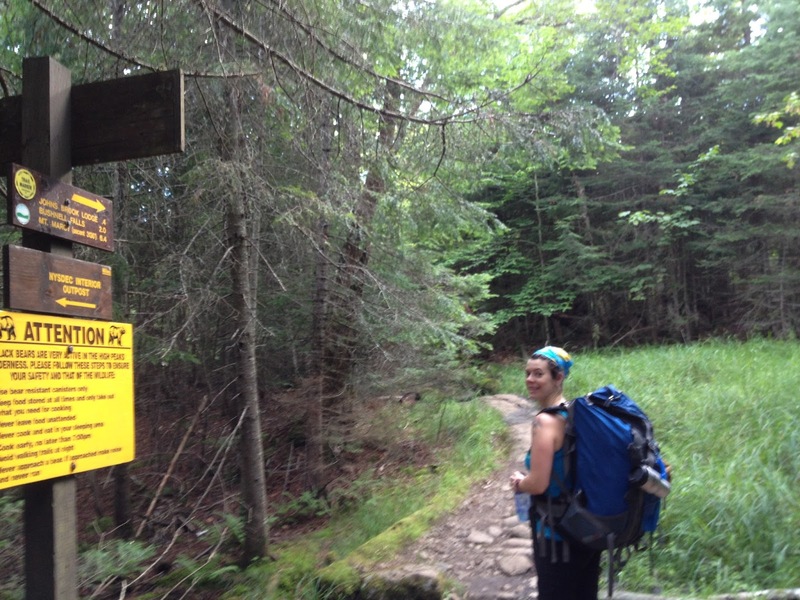 Only, after finishing Lower Wolf Jaw, my hiking partner Stephanie, realized that…..the patch is for “The Wolf Jaws”. That ‘s’ is very important. Being the honest people we are, we held off getting the patch until we had completed Upper Wolf Jaw. So we were really anxious to finally get the thing. Anyway, Sunday morning dawned with lots of clouds, and those clouds were moving pretty quick. A note about the weather in the Adirondacks: If it says it’s going to rain, even if it’s a 10% chance, it’s likely it will. And the weather can change in the mountains – it blows in quickly, and while it may be ok at the base of the mountain, at the summit it’s windy, freezing, windy, rainy, windy and incredibly cloudy. And if lightening should happen when you’re on exposed rock, there’s not much you can do but hurry. We decided to push onwards anyway. Our plan was to re-evaluate the plan at each summit, and turn back when we felt the weather was too inclement to continue. After a brief delay, as we took the wrong path out of JBL (where we saw generators that had been used at JBL) The walk up Woodsfall trail to the five-way junction (and the Ore Bed Trail, which we didn’t take) is pretty easy, but man…..our legs were killing us. The 11-hour hike from the day before was letting us know that even if the weather cooperated, our bodies might not. But, for the most part, the trail is level and easy to walk, so we made good time. 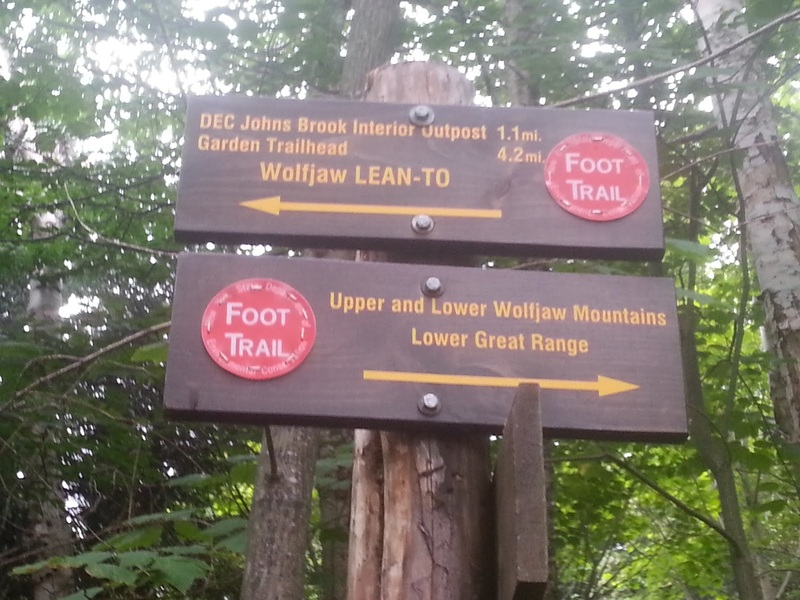 We took the ADK Range Trail and headed to the junction with the trail that leads to Lower Wolf Jaw. I remember this trail being quite nice – it was fairly level, with a few ups and downs, but nothing that pushed us. It was a good warm-up for what lay ahead. Again, we made excellent time to the junction, and the weather seemed to be holding. We thought, at this point, that we would definitely get Upper Wolf Jaw, and quite probably Armstrong, with a slight possibility of Gothics. I live for these signs on my hikes. We sat down to have a snack, and while we were there, a French couple came up the trail that we had just been on. Their goal was also Gothics. We warned them about the weather, as they seemed completely unprepared (small daypacks, that obviously didn’t have rain gear, or much food, running shoes, shorts and tank tops), but they seemed confident. And then they asked us, “Does Gothics have a view?” Well, not in this weather, no. It was still very cloudy, and the occasional spit of rain was still coming down, so the chances of there being a view from Gothics in that weather….not going to happen. 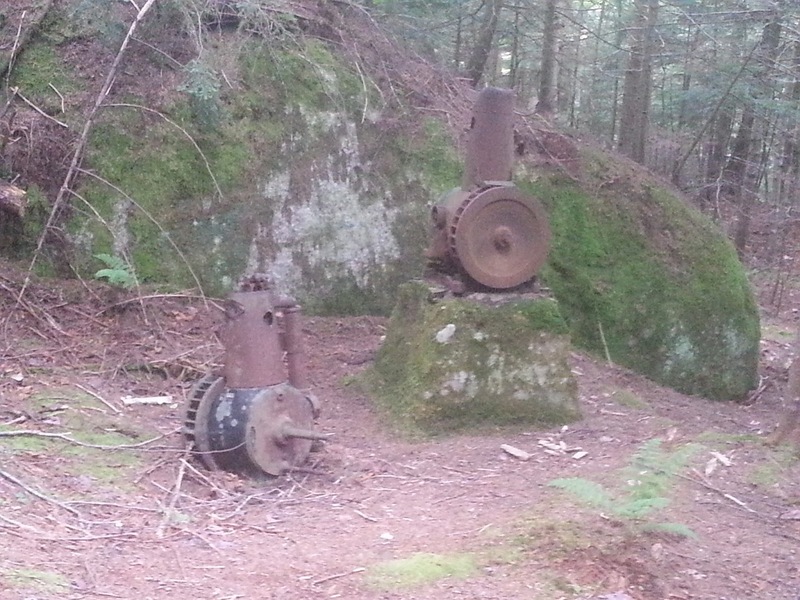 They kept going, and were long gone by the time we started up again. The trail up Upper Wolf Jaw is, well, it’s got its scrambles up rock, but after HaBaSa the day before, it seemed a treat. The only bad part was that the rocks were slick. It does take some negotiating, but the trail is really not too bad. You do have to hike yourself over some rocks, and there was one spot that could have caused us some troubles – you either have to haul yourself up a huge slab of rock, or if you’re thin enough (and not too claustrophobic), squeeze between two huge slabs of rock to get to a spot where you can easily climb up. We squeezed, but anyone much bigger than us would have issues with it. At this point, the trail started to become misty. We were high enough that we had actually entered into the clouds. While this sounds awesome, it was a little wet. Not as wet as it would have been had it actually been raining, but everything was damp. We seemed to keep going and keep going and keep going. The trees began to thin, and the wind picked up. We had a brief huddle and decided that when we reached the summit, we would take a quick picture of our feet (tradition) and a picture of us, and we’d run down to some shelter and have a snack. And then we’d go back to JBL. We were tired, our legs were tired and we just couldn’t face the thought of dealing with the mist, rain and wind for two more summits. The closer we got to the summit of Upper Wolf Jaw, the more resolute we were to turn around after that. It’s right there. how did we miss it? And then….we saw a small trail branching off the main trail, leading to a rocky out-cropping. “Is this it?” we thought. We took the path, battling the wind and mist, and stood on top – quickly snapping our pictures, before running back down. But then we had to determine if that was actually the summit or not, as we hadn’t seen any markers, or signs or anything. So we continued on the main trail, and it…..abruptly started descending. So back we trudge, and as we past the trail leading to the out-cropping, we saw the sign. How we had missed it originally, I don’t know, but it’s right there “Upper Wolf Jaw summit, 20 yds”. We started back down immediately. The trail down was no more difficult that going up, which is surprising because my experience in the Adirondacks is that if it’s easy going up, it’s hell to come down, and vice versa. But this trail we seemed to fly down. We met a few other people who were on their way up, but it was fairly quiet for the most part. We returned to JBL to pick up our packs (yes, you can leave them in the Great Room on the day you check out, if you’re planning a hike), use the washroom, and buy our patch. Then it was back down the Phelps trail to The Garden. It was slow going – we were tired, our legs were sore, and we’d already hiked over 5 hours that day, but we made it. Our options at this point for Gothics and Armstrong is to hike in from the AMR side (by the fancy country club) and go over Pyramid and Sawteeth (another 46er) and back out that way, or to have someone drop of us at the AMR, hike over Pyramnid, Sawteeth, Gothics, Armstrong and Upper Wolf Jaw again. Alternately, we could do the loop we had originally planned to do, and leave Sawteeth and Pyramid for another hike. It won’t be this year, that’s for sure, but perhaps next. 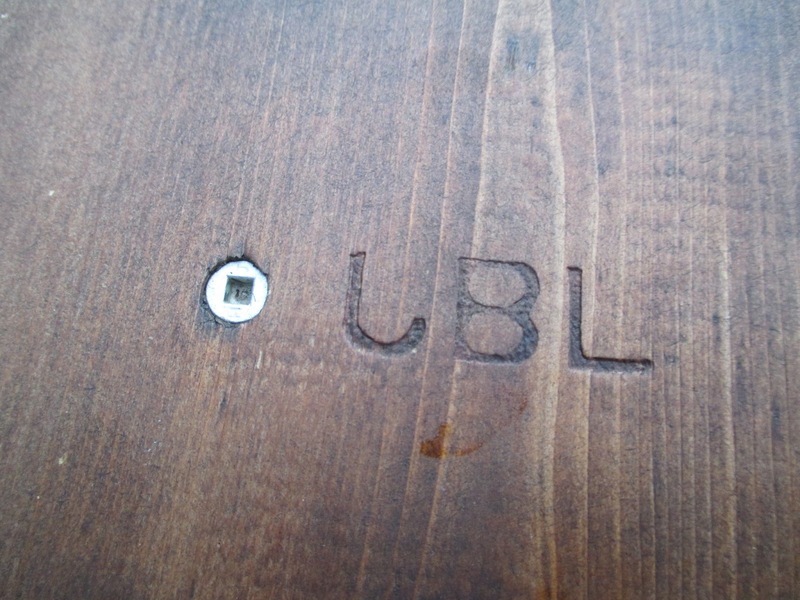 And this way – we’ll get another stay at JBL! 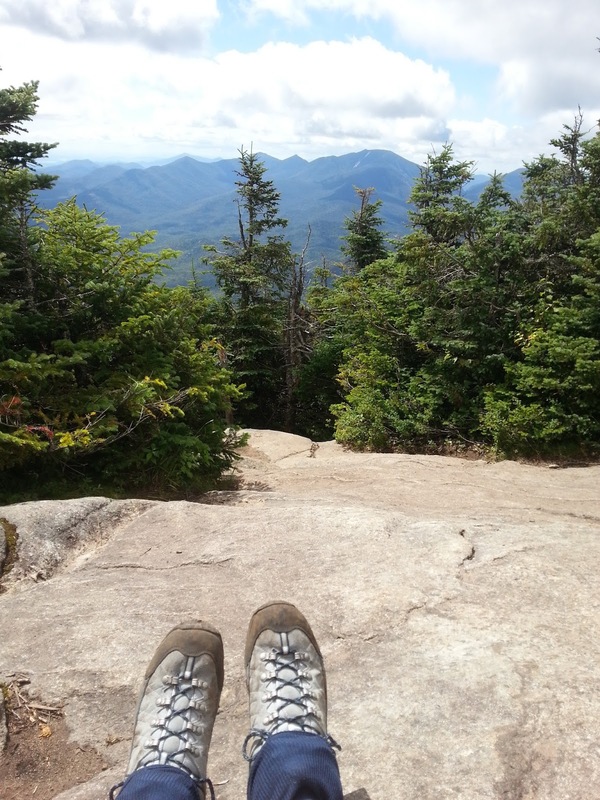 It was down to the Adirondacks for another long weekend of climbing and luxury camping, if you can call what we did camping, and if you can call Johns Brook Lodge luxury. I should probably start at the beginning so you can follow that. First, Johns Brook Lodge (JBL). 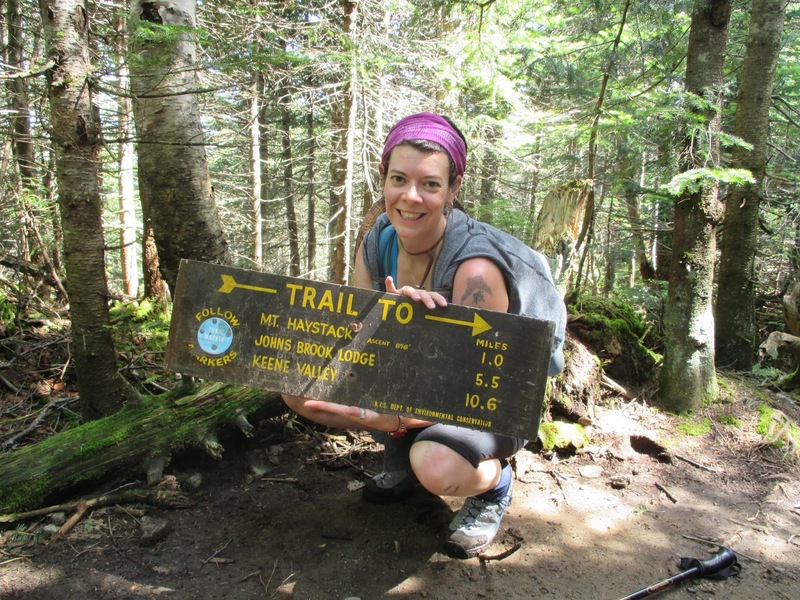 This is a hike-in facility run by the Adirondack Mountain Club (ADK). It’s a 5.6 km (3.5 mile) hike from The Garden parking lot to JBL. It’s a full board lodge, at least between late-June and Labour Day. The staff, there were three when we stayed there, hike in all the food. Any special dietary needs (gluten-free, egg allergies, etc.) need to be communicated at least 24 hours in advance so that the staff can bring in any special food (my friend Stephanie, who has celiac’s, had gluten free pancakes one morning). But this is no luxury lodge – the rooms are all dorms (there are two general 10-bed dorms, and two family four-bed dorms), there’s no electricity, no shower and no flush toilet. Not to dissuade you too much – the privies are clean, with a seat (no squat toilets! ), and there are sinks to wash your hands/do a bird-bath after your climb. The water is also potable, so you don’t need to hike in water for your stay. And, while there is no electricity (and no charging phones, batteries, or cameras), there are propane lights, and propane stoves. We had wonderful meals (turkey, mashed potatoes, bacon, sausage, eggs, oatmeal, coffee, BBQ chicken, etc.) while we were there, and they prepared a bagged lunch for everyone each day. Additionally, it effectively cuts 11.2 km (7 miles) off your hike; if you’re planning to do the Haystack-Basin-Saddleback (HaBaSa) loop, this is definitely a good thing. Our big plan was originally to do a Gothics-Armstrong-Upper Wolf Jaw loop, and spend a night camping at Johns Brook Lodge. We’d hike in on the Friday, spend the night, do the loop on the Saturday, hike partway out and camp in a lean-to, then hike the rest of the way out on Sunday. This plan then grew to doing Saddleback-Gothics-Armstrong-Upper Wolf Jaw as a loop on Saturday, spend an extra night at JBL on Saturday, and then hike Haystack and Basin on Sunday, before hiking out. Which changed one last time when we saw that it was to rain on the Sunday. Everything we’d read said don’t climb Basin or Haystack in the rain. 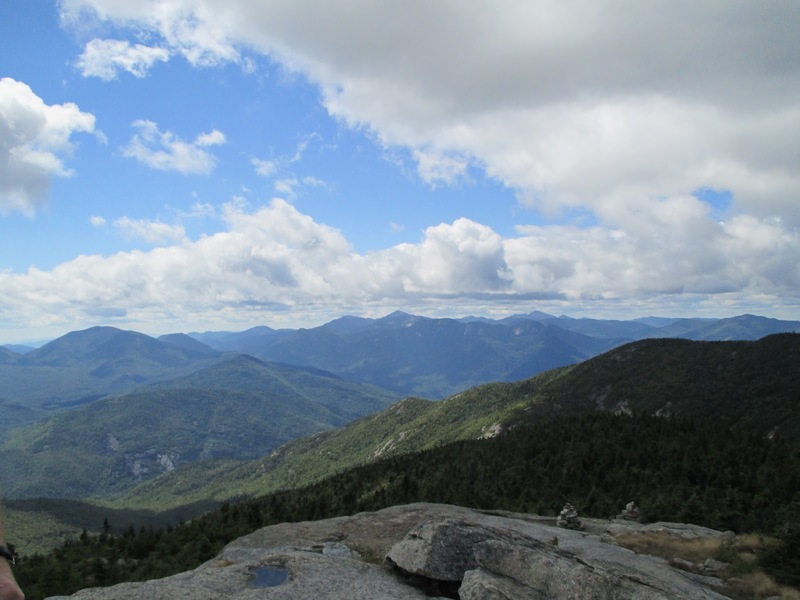 So our game plan, upon reaching the Adirondacks, was to do the HaBaSa loop on the Saturday, then the Gothics-Armstrong-Upper Wolf Jaw on Sunday. Ambitious, to say the least. Our hike in was a little slow – it was the first time that we had carried full backpacks (with clothes, sleeping bags, extra snacks, and our day packs) and we wanted to make sure to conserve some energy. It probably took us close to two hours to reach JBL. Once there, we quickly unpacked and sat outside enjoying the view, as well as sharing stories and tips with the other hikers. The great thing was that most of them were also aspiring 46ers, including two women (also from Ottawa!) who were set to complete the 46 the next day with a hike up Haystack. It was an early night for everyone, and a mad scramble the next morning as everyone prepared for their hikes. We had filled our camelbaks and water bottles the night before, so after breakfast (eggs, oatmeal, sausages), we grabbed our lunches (two sandwiches – one pb and j, the other ham, as well as trail mix and cookies), stuffed them in our day packs, and set out. The first few miles were definitely easy, with a few rolling up and downs, but nothing strenuous. This always scares me, because I know that at some point there’s going to be an up, and the longer it takes to get to the up, the harder that up is. And that certainly proved true, as we had 878 feet to climb in a mile. But, we thought, ‘how hard can it be’? Not very, it turned out. It is steep, and it is rocky, and it was wet (and buggy) but it wasn’t too bad. I wouldn’t want to go down it, but up – it was fine. We got to a rocky outcropping, where a woman was sitting, and I got all excited, “Is this Little Haystack?! ?” I asked. No, it wasn’t. “Is it BIG Haystack?! ?” I asked in jest, no it isn’t. “Is it Needle-In-A-Haystack?! ?” Stephanie jokingly chimmed in, and after a laugh we all agreed that would be the name of that outcropping. So, for those of you follow us, you will first summit Needle-In-A-Haystack, then Little Haystack, then descend Devil’s-Half-Mile (more on that) before finally summiting Haystack. 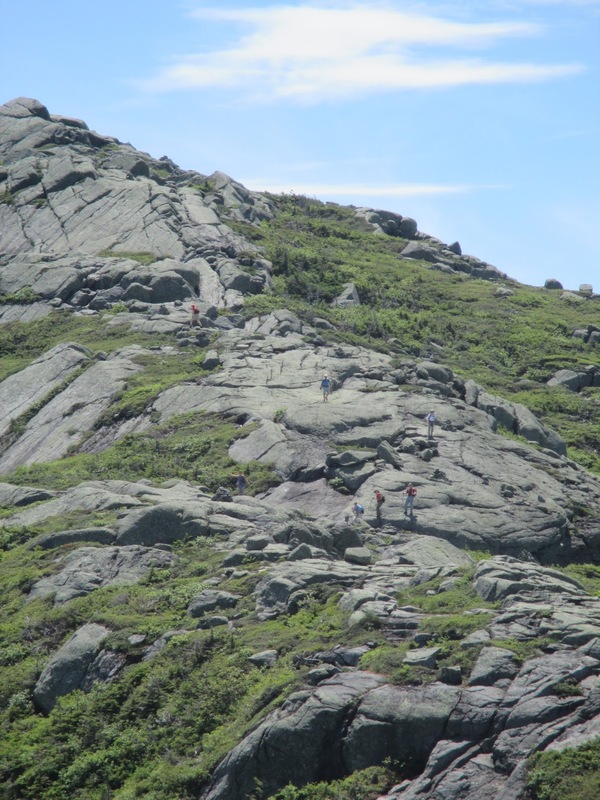 The trek between Little Haystack and Haystack, Devil’s Half-Mile, is a little bit daunting. It involves walking carefully on small ledges along the rock face, and gingerly scaling the rock face up towards Haystack. It’s not hard, but it does require some concentration, and I definitely wouldn’t like to do it in the rain, or on wet rock. 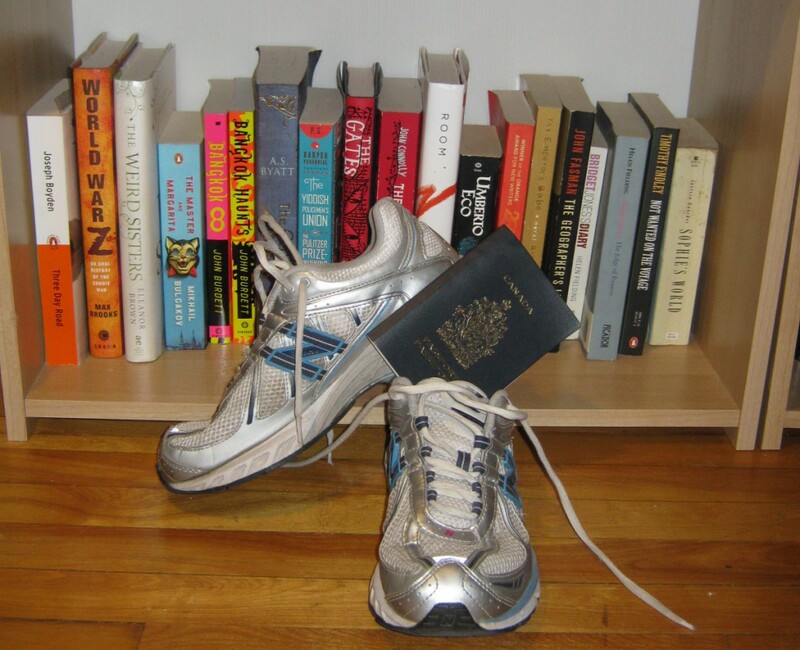 The best piece of advice I can pass on is….leave your poles (or pack them into your day pack.) We left ours by a cairn on the way up Haystack, which made the rock scrambling that much easier. (And yes, they were still there when we got back down.) Follow the yellow paint blazes and you’ll be fine – there are lots of hand holds and toe grips, and for most of it, you can walk upright, if a little slanted forward. We convinced two other hikers to do the rest of the loop with us. Their group was only planning on doing Haystack, and they had been debating doing the Basin-Saddleback loop but were unsure. In retrospect, I’m very, very, very glad that there were four of us. 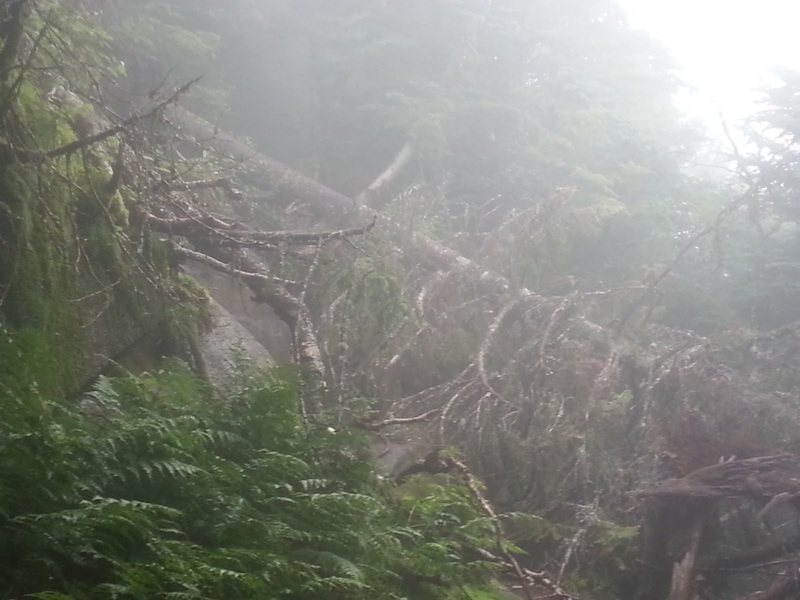 The trail up the Saddleback cliffs was….scary. Especially in the moment. But I’m ahead of myself here. Going down Haystack was a lot easier than going up – possibly because we had only spent about 20 minutes at the summit, and the way was fresh in our minds. We raced back up and over Little Haystack, and back down to the trail, that branched off towards Basin. Basin was a little slower going. It was quite steep, and there was a bit of rock scrambling to get up and over some of the larger boulders. And, because of course always, there was another ladder. I practically hopped my way up, I was so happy I didn’t have to climb down the thing. The other two people had gone on ahead, and we ambled our way towards the summit. We’re not fast hikers, and we’re ok with that. We hike at our pace, and we get there. Plus we enjoy it along the way. We met a few people along the way, including a couple who had come up over Saddleback before tacking Basin (doing it the opposite way from us), with full on backpacks. Like massive full on backpacks. 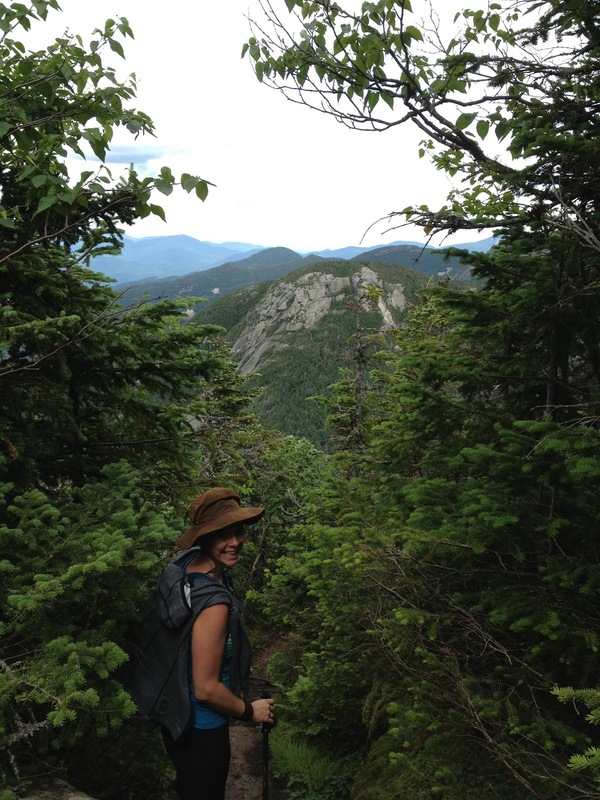 So some more advice – do not do Saddleback-Basin-Haystack. Especially if you have full on massive backpacks. So back to these cliffs. Have you seen “The Princess Bride?” And do you remember the Cliffs of Insanity? It’s basically that. Only I’m exaggerating just a little bit. (Although, we did have a woman following us, and I swear she kept gaining. It was very Princess Bride.) The cliffs aren’t that bad. There are three ‘sets’ that you have to climb. The first one is probably the hardest, because you have no idea how to begin. Thankfully, the other two people went first and coached us up. Once you get the first foot up, and the first hand-hold, the rest just seems to “flow” – you can easily get up the first set of rocks. After that there’s a small area to stand and catch your breath. Then it’s up the next “set” – again, once you get going, it’s easy to keep momentum up to the next flat-ish area. I found the third one the hardest – this one seemed to have fewer hand-grips, but did have some space to wedge an arm against the rock and push yourself up. And then…you’re there. You’re at the top, or at least very close. You have to walk around the rocks a bit (again, on an angle as you are still on a bit of an incline) but after one brief haul up a rock, you’re at the summit. You’ve made it. You have accomplished one of the hardest hikes in the Adirondacks (that’s what I think, and I swear I have read it somewhere else.) Is it scary? Yes. Could you hurt yourself, badly? Yes. Should you have company? Yes. Should you do it the opposite way? No – because then you’d see where you are going, dooooooowwwwwn, and that is just….stupid. Go up. Climb. Climbing it is easier than trying to descend it and have clean underwear at the end. Once atop Saddleback, we took a group picture with our other two hikers, Chris and Eric. This summit was Chris’s 16th, our 17th and Eric’s 20th. We were all a little battered and bruised – I have a few (very minor) scratches from my climb up, as did most of the others. But we made it, and the pride….man. If you’re wondering if you can do it – yes you can. Take a deep breath, and go. We all slowly hobbled down Saddleback. 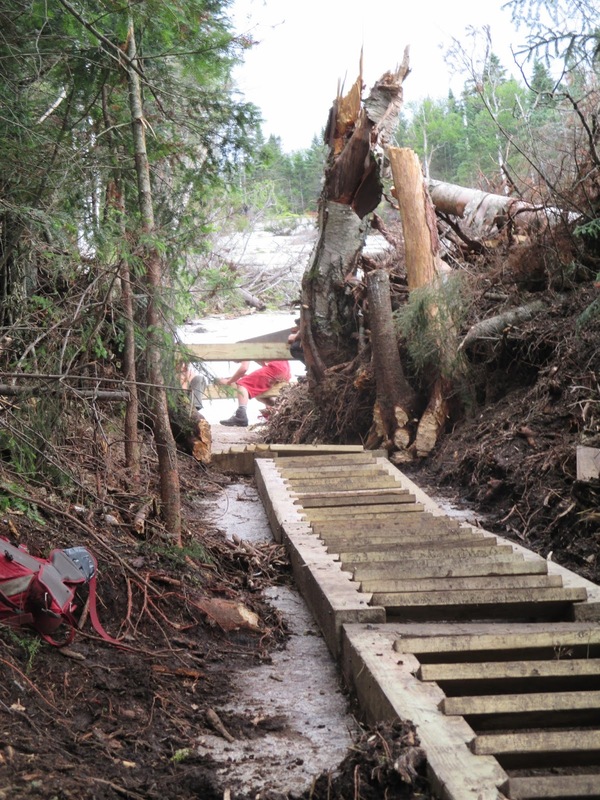 We met a crew doing trail repair on the Orebed trail – they were building a new ladder up the slide, to maybe? replace one taken by Hurricane Irene. The devastation left behind by the hurricane is incredibly evident – the slide is desolate, and piled at the bottom is a massive amount of dead wood – trees, branches, roots. It’s just incredible. If you’re thinking of doing the Orebed trail, it’s not too bad, at least until the split with Gothics. From the base of Saddleback to the bottom, it’s fine, especially with the new ladders. (I hear that the portion from the split to Gothics summit is a must-go-up, because of the cables.) We were a little slow on descending – Stephanie and I went ahead, and Chris and Eric took it slower on the way down. I was so ready to stop walking. There are a few times, as you cross slides, that it might be easy to lose the trail. Follow the cairns and the trail markers, and you’ll be fine. We did get lost at one point, but we just back-tracked to the last marker, and then made our (corrected) way from there. I guess that’s the thing with the Adirondacks; it’s like the Hitch Hikers Guide To the Galaxy – Don’t Panic. If you ever think you’re lost, just go back to the last marker, and re-find your way. We walked for what seemed forever, when we hit a lean-to. The lean-to is half way along the Orebed trail, and we couldn’t believe that that is where we were. We honestly felt like we were closer to the end. But we kept walking, and a little bit later hit the junction for the trail that leads to JBL. The good news is that if you’re staying at JBL, you don’t have to walk the half-mile back to the Interior Outpost to start your hikes – there is a trailhead at the lodge. At this point we were moving on auto-pilot. One foot in front of the other. All we could think of was the BBQ at JBL that night. Dinner is served at 6:30, and we knew it would be close. Finally, after two river crossings, and a horrid, horrible, set of “stairs” we neared JBL. By this point it was 7:00, but thankfully dinner was still on, and there was lots of food. As we walked in (me first, Stephanie a few seconds behind me) two massive cheers went up from the hikers already back at camp. They clapped and cheered us as we entered the lodge and we were both overcome with the sense of camaraderie. We quickly devested ourselves of our shoes and socks, and sat down for some well-deserved dinner. About 10 minutes after us, in came Eric and Chris, and another massive cheer came from those of us at dinner.